D.C. Metro's shutdown notification posted to its Facebook page. 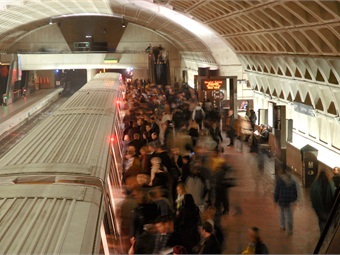 The Washington Metropolitan Area Transit Authority (D.C. Metro) suspended Metrorail service beginning Wednesday, March 16, for emergency inspections. Metro General Manager/CEO Paul J. Wiedefeld announced full closure of the Metrorail system for so inspections of the system's third-rail power cables could be conducted following an early morning tunnel fire Monday, March 14. The inspections of approximately 600 "jumper cables" will occur along all tunnel segments on the Metrorail system. At the conclusion of the inspection process, there may be a need for additional rail service outages, D.C. Metro officials announced. 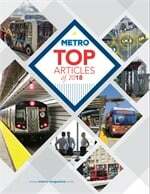 The Metrorail system, which closed at midnight on Tuesday will remain closed until 5 a.m. Thursday. 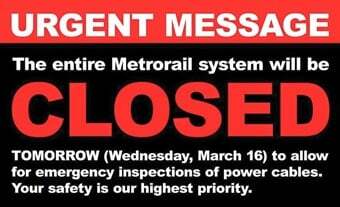 All six Metrorail lines and all 91 stations will be closed on Wednesday. The unprecedented action follows the early Monday morning electrical fire involving a cable in the tunnel outside McPherson Square Station. There were no injuries; however, service was disrupted along the Blue, Orange and Silver lines throughout the day. The investigation into Monday’s cable fire at McPherson Square is ongoing, according to Wiedefeld. “As a preliminary matter, the conditions appear disturbingly similar to those in the L’Enfant incident of a year ago, and our focus is squarely on mitigating any risk of a fire elsewhere on the system,” he said.